Where Painted Trees and Flowers Grow! what a cabaret singer can accomplish, and to hear her sing anything by Craig Carnelia is like watching Jonas Salk discover a vaccine -- it just amazes you what the human being is capable of. Marilyn O'Connell simply is, in a word or two, unequivocally brilliant." The absolutely superb Marilyn O'Connell performs at Eighty Eight's ... with special guest Brian Gari, all under Marc Malamed's direction. O'Connell possesses one of the loveliest legit voices around. "Singer-actress Marilyn O'Connell lights up this elegant club with class, warmth and a classically trained voice. Her set could be a textbook study on how to put an act together. Although O'Connell's forte is the romantic ballad, she offers ample comic spice as well. Here Comes the Ballad, a witty parody of nitery chanteuses with a weakness for purple emotion, is rendered with comic accuracy. Ditto for the tongue-in-cheek You Can Kill Love. O'Connell truly scores with her intensely personal readings of torchy love songs. Chestnuts such as One More Ride on the Merry Go Round, and Music, Maestro Please throb with emotional commitment. She captures the illusion of romance and its sometimes bitter outcome." is a gifted actress/singer capable of weaving a magic spell and doing more with a lyric than many of today's more lauded divas, holding the audience in a hushed, breathless spell. Her clarion soprano is sensitive, warm, and lyrical. She brought a new meaning to a dramatic Just a Housewife by Craig Carnelia, as well as to Randy Edelman's Woman on Your Arm. Her reading of You Have Made Me Love from Anthony Burgess' Cyrano totally riveted the audience, creating one of the most memorable moments this observer has seen in cabaret. Always an intelligent singer whose emotions come straight from the heart, she also applied her fine flare for comedy to the set. We're lucky to enjoy Marilyn O'Connell up close before this veteran is snatched up by some perceptive Broadway producer." Marilyn O'Connell as mentally-challenged homeless Mary in Piper's Song . . . "standout who not only shines in brief solos, but in every moment she is seen. Mary's Beware These Men is sold with gusto." As Carlotta in Yeston's Phantom - "O'Connell has a rich, full voice . . . a standout performance as Carlotta ... her talent can't be disguised in her solo rendition of This Place is Mine." Marilyn O'Connell is outstanding in her vocal performances - one which extends from the stage and grabs the audience. Each note of her solos is crisp, each word clear -- a necessary ingredient for full comprehension of Brel's fast and often complex lyrics. "Marilyn O'Connell as wife, Meg, is quite touching here, the heart of this recording." _ TALKIN' BROADWAY - Review of Damn Yankees StageStars cast recording. ". . .there would be no justice if I didn't mention the magnificent stellar talents of Marilyn O'Connell who nearly stole the show with her solo turns. This was especially so during her tour de force reading of Music Maestro Please from Underneath the Arches. Few performers I have ever seen could have brought what this lady did in this showstopper-extraordinaire. Truly, she managed to create one of the most movingly wrenching musical moments I've witnessed on any cabaret or theater stage." From the moment she makes her entrance it is evident that in Marilyn O'Connell, the musical is blessed with one of the most beautiful and musically talented Annas ever to assay the role--on stage or screen. The best of Mr. Rodgers' songs and Mr. Hammerstein's lyrics, to be sure, fall her lot, and take on Miss O'Connell's luminous performance. Miss O'Connell is a very believable Anna, the proper English governess, but in her Playhouse debut it's the lilting quality of her voice that uplifts "The King and I" and brings out the full flavor of the Rodgers and Hammerstein tunes. 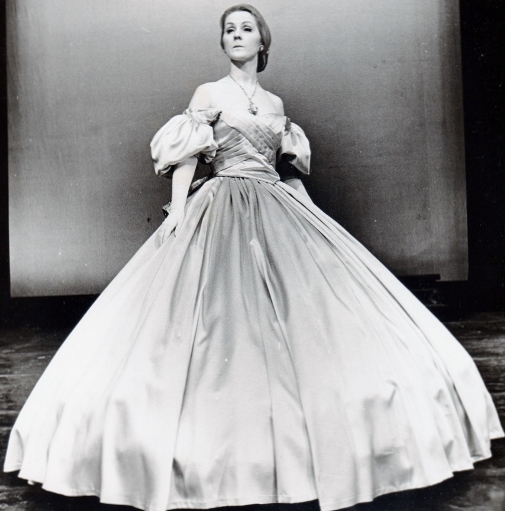 As Anna Leonowens in"The King and I"